The forestry was and still is one of the most important activities in the Kočevska region, which covered by extensive forests. Reasons for the colonisation of this region were economic benefits of landlords, since the serfs, i.e. their subjects, had to pay the authorities the prescribed taxes. The colonists living in the Kočevska region cleared and burned down forest for land cultivation. It was only a steep and rocky terrain which inhibited the further clearing and settlement. As early as the Middle Ages, the regulations started to be adopted determining the treatment of forest products. A lack of certain products and endeavour of owners, i.e. feudal lords, to turn a low valued forest land into a source of permanent benefits and income led to the emergence of legally regulated relationships. Landlords had the right of the Forest Law – the right to prohibit clearing and other use of forests and the right to punish everyone who violated the rules. After settling the imposed taxes, the subjects were entitled to pasture, wood, strewing and even to some game (birds of prey, dormouse). Agricultural land belonged to farms, while forests were publicly owned and regulated by landlords. After the emergence of new economic and political situation in the 15th century, landlords saw the opportunity to increase their income by stimulating the development of mining, ironworks, glassworks and shipbuilding industries. In 1613, the reformation commission visited the Kočevska region to re-evaluate and reform the landlord structure. One of the commission’s decision worth mentioning is the Decision of 9 January 1614 on the protection of forests. It prohibited the felling since the forests represented a kind of defensive wall and protection against the Turks. The start of operation of blast furnace in Čabar in 1651 caused a mindless felling of trees in the Kočevje-Log forests triggering long-standing disputes between the Carniola provincial government and the owners of the Čabar district, the Zrinjski family. The economy was very extensive. Mainly, they grew similar cultivated plants as in other parts of Carniola. The Kočevska region was a land of cereals until the arrival of Napoleon. After the expansion of transport routes, the competition forced the local citizens to cattle farming. Almost all pastures were owned by the village communities. The pastures were called Gmajna (the commons). The Kočevje district had the largest pasture land in the whole Drava Banovina. In 1641, the rule of the Kočevje and Poljansko lordships was taken over by the Auerspergs who made a great impact on the events in the Kočevska region over the next 300 years. Upon the establishment of the fideicommissum in 1677, the area of Auersperg forests was estimated to 43,125 ha. The main forest areas in the Kočevska region were the Rog, Fridrihštajn and Gotenica mountains. Until the cadastral surveying in 1823, the forest area was reduced to 27,600 ha due to widespread forest clear-felling for agricultural land. The March revolution in 1848 was another turning-point liberating the peasants from serfdom and thus abolishing the last of their tributes in goods. The size of the Auersperg estate in the Kočevska region decreased in the 1855 – 1885 period for the benefit of farm forest to 22,551 ha, i.e. around 18,200 ha under the Kočevje forest management and 4,351 ha under the Soteska forest management. Forest was one of the main reasons for people to stay in this poor land. The serfs had a right to harvest wood, chop wood for heating, tend to cattle, gather stewing and other incidental products, not knowing if they are owners or subjects. Thus, the boundaries between forests, fields and pastures were often moved against the will of landlords to more distant locations from the settlements. The easement rights to harvest structural wood and wood for crafts gradually resulted in predominance of the beech stands in the surroundings of settlements and populated areas and causing the fir stands to disappear. The landlord Heinrich von Auersperg enacted strict ordinances on respecting and protecting the forest boundaries in 1752. The ordinances were legislated to stop the unregulated and unplanned exploitation of surrounding forests. However the local population failed to comply with these regulations. Only after the land release in 1848, the forest boundaries were finally arranged. From 17,000 to 34,000 cubic meters of beech trees were annually felled in Rog for the operation of the Dvor ironworks (1796-1891). The suitable forest areas (fratas) were cleared. If these areas did not overgrow by themselves, they were reforested with spruce and larch tree, whereby the latter with less success. Gradually, 1,500 ha of forest were clear-felled by using this kind of forest exploitation. Thus, the natural structure of Kočevska forests began to change. In its twenty years of operation, the glassworks in Glažuta caused from 350 to 400 ha of forest to be felled, i.e. 8,000 cubic metres of wood per year. Denuded areas were planted with spruce trees or the forest vegetation regrew in a natural process. The charcoal and glassworks industry caused around 1,560,000 m3 of wood to be felled in the Kočevska region. The majority of charcoal was produced in agricultural forests without a planned management which led to the devastation of forests. There were four important periods from 1848 to the end of the Second World War in the Kočevska forestry industry. The characteristic feature of the first period up to 1857 were laws regulating the ownership issues and forest management methods as well as the construction of the south railway line to Trieste which stimulated the economic market in the Kočevska region. 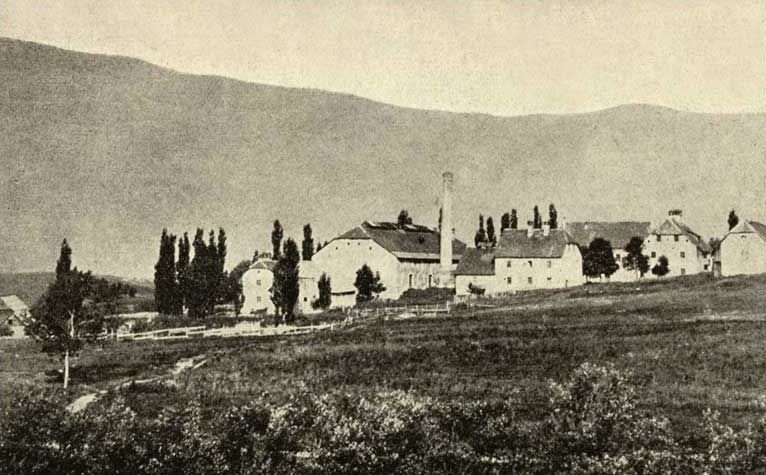 The second period up to 1892 included the construction of forest roads and forest sawmills, while the third period until the end of the Great War saw the forest management plans for large estates, construction of the Grosuplje – Kočevje railway and the Dolenjska railway section to Straža and the construction of modern steam sawmills in Rog and Jelendol. The last period encompasses the agrarian reform and economic crisis. With the fall of serfdom and hunting laws of the landlords in 1848, the abolition of easements began which had a great impact on the later forest state. Farmers, now becoming equal neighbours, began to manage forest in a non-economic way and overexploit it due to the purchase of easements. Due to poor transport conditions, the wood could not be properly exploited. The lack of knowledge and ignorance of market situation brought farmers to sell their wood at ridiculous prices to merchants who bought the best logs and even entire forests. Since the adopted forest ordinances for different Austrian provinces did not meet the changed socio-economic situation, the Forestry Law was passed which outlined new guidelines for forestry regulation. Before the enforcement of the law, the issue of forest easements had to be resolved. The Reichs-Gesetz of 1853 regulating the purchase and arrangement of easement was used as a basis. The purchase of easements in the area of the Auersperg estate was finally executed in 1888 since the easements had to be proceeded individually. The Auersperg estate gave the claimants about 9,900 ha of land, of which 4,507 ha of forest was located mainly on the low slopes. The estate kept the forests on the mountain plateaus (22,551 ha). It did not take long for the new owners to sell their land cheaply to merchants and resellers. There were 21,824 ha of small land in total. Apart from farmers, also churches and later also non-farmers became the owners. The period ended with the construction of the south railway to Trieste in October 1857. The construction of road infrastructure and industry facilities was very difficult in the Kočevje forests due to the lack of water on the extensive Karst plateaus, remoteness of railways lines, difficult access due to rocky, steep terrain and dolines. For these reasons only the industry of semi-manufactured products was developing. Final products remained in the domain of the cottage industry. First forest roads were built in the areas with the charcoal-burning and glassworks industry. Thus, the road from Grčarice to Glažuta had already been built in 1833 and 1834. In 1840, the road from Podturn to Podstenice was constructed for the purposes of charcoal transport to the ironworks in Dvor. In the second half of the 19th century, many public roads were reconstructed and several forest roads built in the Kočevsko area. The main initiator of these works was the forester Ernst Faber, an administrator of the Auersperg forest administration. The period from 1876 to 1897, coinciding with the construction of industrial sawmills, saw a full swing of the forest road construction. The exploitation of forests was still restricted until the construction of the Kočevje and Dolenjska railway. Only the most valuable wood was transported to the more remote places with animal driven carts. From 1897 to the end of the Great War no significant forest road was constructed. Between two wars, mainly reconstructions and extensions of the existing roads and the construction of some short sections took place. The route designing and expert supervision was conducted by the foresters of the Auersperg forestry administration. Apart from roads, cable railway to Stružnica and forest railway line in Rog, also tens of kilometres of hunting or riding trails or routes were constructed. Initially they were used for hunting and later also for wood skidding with sledges in winter and transport of charcoal and chopped wood with draft horses. Wood for sawmill industry was harvested from the nearby forest district. Forest areas rather than individual trees were marked for felling. From 30% to 50% of wood was utilised. 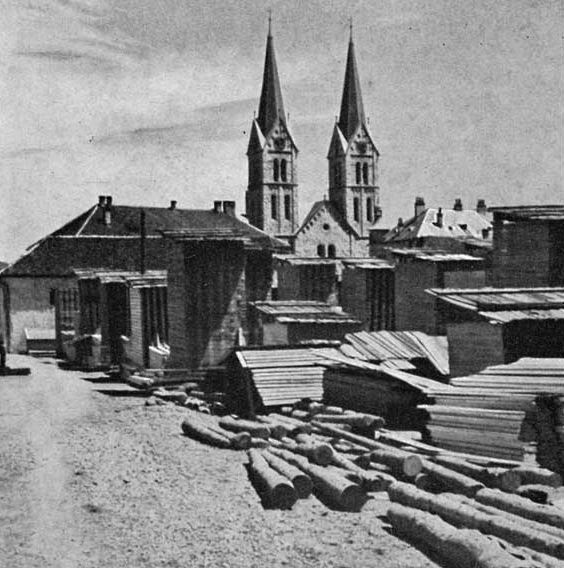 After the construction of the Ljubljana – Trieste railway line in 1857 and Karlovac – Rijeka in 1873 and a new Italian market opened, purchasers also started to fell excessive volumes of wood defined in the contract. The volumes exceeded the contractually determined quantities even three times. Such an irresponsible exploitation of forest led to the destruction of forest causing the estate administration to organise expert services and regulate and control forest management. The system of clear-felling, which was implemented during the times of ironworks in Dvor, glassworks in Glažuta and sawmill industry in Goteniško pogorje, had an impact on the change of tree and age structure of stands. There occurred vast overgrowing areas. Due to considerably lower price of beech logs compared to fir logs, the fir stands were almost completely cleared in some places. The Auerspergs soon realised that the wood sale in domestic and particularly foreign markets was a very demanding business and thus started to lease their forests to be exploited by wood merchants. With long-term lease contracts it was easier to reap long-term benefits from the forest and not merely satisfy the purchasers’ appetites. A higher wood demand called for the provision of sustainability which led to the planned forest management with forest management plans according to the principle of sustainable profit, planed construction of forest routes and industrial facilities. In 1885, the preparations for a systematic arrangement of forest management planning and survey of all estate forest began. Allegedly, the forest authority issued a regulation permitting the exploitation of estate forests only on the basis of forest management plans. Large forest lands began to be systematically regulated in 1888. The first attempt of regulating the Auersperg forests was drafted already in 1886 in the Glažuta district. This arrangement still relied on the clear-felling and reforestation with the spruce tree. The plan was finished in 1889, but due to incorrect substantive premises and calculation errors turned out to be useless. After the death of Ernst Faber in 1890, the systematic regulation of forests and preparation of forest management plans were taken over by Leopold Hufnagl. He divided the Auersperg forest estate into three separate forest complexes: Goteniško pogorje, Fridrihštajn and Rog. Each complex represented an individual operation class, for which the plan had to be made. At that time, agricultural forests, the Kostel castle forest and forests of Kočevje were not regulated. A period of economic expansion of Kočevje forests was followed by the introduction of the profit sustainability principle, strict measures related to forest care and protection, construction of the infrastructure, etc. The felling of Kočevje forests increased from 41,070 in 1892 to 96,836 m3 in 1896 and 97,795 m3 in 1897. 56,500 m3 of beech wood was felled in 1912 for the needs of charcoal-burning alone. Forest production decreased substantially during the Great War. Mainly the fir tree was felled in the areas near sawmills. The felling in these forests was excessive, gradually causing the degradation in stand structure. After the war, the forest production increased rapidly. Wood industry presumably also showed an interest in minority tree species, such as alders, white poplars, hop hornbeams, ashes and other. In 1918, the Kingdom of Serbs, Croats and Slovenes was established. One year later, the agrairan reform started to be implemented in its entire territory. It took almost 20 years for the Auersperg estate to complete the reform, i.e. in 1938 in the then Kingdom of Yugoslavia. During the long-lasting implementation of the agrarian reform, the estate lost around 18,000 ha of land, i.e. around 17,500 ha of forest which came under the temporary state administration. It was left with 5,661 ha of land and the Žužemberk and Kočevje castles. The Auerspergs received a payment for this land. However, the payment did not correspond to the actual estate value. The time of the implementation of agrarian reform was also the time of intensive felling by which the owners (also the Auerspergs) wanted to harvest the largest quantities of quality wood possible from the forests. However, the felling in the Rog forests was not so intensive. The general economic crisis in forestry lasted from 1930 to 1938. Forest products and wood prices were cut in half compared to the pre-crisis period. People in their financial distress felled excessively and thus endangered the forest-related profits. The Italians intensively tried to exploit the Kočevje forests during their occupation, but fortunately with no success. The capitulation of Italy in 1943 stopped all works in Kočevje forests. On 20 September 1943, a new forest administration of the expropriated Rog forests was established, followed by the Forestry Department in November which supposedly operated until the foundation of the Forestry Sector, the Commission for the national property management and the Commission for forest protection at the 1st meeting of the Slovene National Liberation Committee in February 1944. The objective of the Forestry Sector was to organise the forestry service in all Slovenian regions. The Sector was the beginning of the post-war Ministry of Forestry. The property of Auerspergs was finally confiscated with the Decision of the Anti-Fascist Council for the National Liberation of Yugoslavia in November 1944.
pasture forests overgrown with pioneer tree species (the initial phase of vegetation) and rare climax tree species representing the final stage of vegetation. To accommodate forest workers and establish forestry centres, the forest management had been assigned 14 villages. Before the 2nd World War, the forest workers were mainly Slovenes and Croats, whereas the majority of them came from the Republics of the then Yugoslavia after the war. There was always a shortage of workers. By 1948, prisoners of war represented the majority of labour force. The forest management plans existed for the Auersperg estate, the forests of the Mestna hranilnica ljubljanska and forests taken over by the temporary state administration. Some estates had their plans drawn up already before the war, but they were not found in the national forest administration records. The Emona forests and the forests of the Trbovlje coal mine company had no management plans. The regulation of state forests were undertaken by the Kočevje Forest Management, established with the decree of the government of the People’s Republic of Slovenia on 17 January 1947. It took over the forests of all estates, the forests of Gottscheers and emigrants. During the first years after the war, there occurred many unplanned felling in the Kočevska region ordered by the authorities. During the 1947 – 1951 period over one million of m3 of wood was unprofessionally and excessivelly felled due to the great demands. In 1952, individual agricultural holdings were incorporated with the Kočevje Forest Management. The Kočevje agricultural-forestry estate was established on 14 March 1952 with the Decision of the People’s Republic of Slovenia. In 1953, the government of the People’s Republic of Slovenia established the Snežnik Kočevska Reka estate covering approximately 13,000 ha. Due to the construction of the Republic protection facilities in Gotenica and Škrilje, the area closed to the public was formed. The area was managed according to the specially adjusted purposes up until 1990. All other forests were managed by the Kočevje Forest Management. Only after 1952, the forests were again managed according to the expert principles. The Forest Act of 1953 demanded the preparation of forest management plans by individual forest management units for all forests. In 1953, the systematic forest arrangement started, i.e. the preparation of forest management plans of individual Forest Management units. By 1964, the plans for main and former agricultural (Emona) forest were made. First reviews of plans started to be conducted. The Snežnik estate joined the preparation of forest management plans in 1961. The joint management of all forests within the scope of the forest management area was enacted by the Forest Act of 1965. Thus, the professional and expert work was ensured also in the private land. With the Rules on the preparation of forest management plans and records of their implementation of 1967, detailed regulations were given for the preparation of the forest management plans of the Forest Management area. The first forest management plan of the Kočevje Forest Management Unit was drawn up for the 1971 – 1980 period. The game breeding and hunting preserve Rog with Snežnik Kočevska Reka was established in 1948 and operated within the Administration of the game breeding and hunting preserve of the People’s Republic of Slovenia. In 1961, it was incorporated in the Kočevje Agricultural-forestry company and therefore seceded and joined with the Snežnik Kočevska Reka estate. The name Medved game breeding and hunting preserve was acquired in 1974. The Medved specific-purpose hunting grounds was renamed with the Decree on the establishment of specific-purpose hunting grounds in the Republic of Slovenia (2004) in 2005 when also the boundaries of the hunting grounds changed. In 1964, the hunting grounds established the 1,007 ha large pen – Smuka for the intensive game breeding (boars and fallow deer) and in 1972 another 1,017 ha large pen – Stari Log. Due to changed economic situation and indicated political changes, the programme of developmental, technological and personnel renewal was prepared for the Kočevje Forest Management. It ended with the division to the contractors’ part and a public forestry service and brought dismissals, intensive investments in development, modernisation of production, intensive work in the nature conservation field in the scope of the Kočevje nature park and information system upgrades. After 1991, there commenced the period of changes in the forestry organisation. By implementing the National Farm Land and Forest Fund Act in 1993, the forests became the property of the Republic of Slovenia, while their manager was the Farmland and Forest Fund of the Republic of Slovenia. The Forest Act of 1993 prescribed the establishment of the Slovenia Forest Service as a public forestry service. Foresters were divided into those planning forest works and those executing these works. The Slovenia Forest Service, Kočevje Regional Unit takes care of forest development plans in all fields in the Kočevje Forest Management Region. Gozdarstvo Grča d.d. (former Kočevje Forest Management Unit) and Snežnik d.d. (former Snežnik estate) conduct all forest operations in state forests as concessionaries. In private forests the operations are usually executed by owners themselves.